Panoramic sunset at Domme, Dordogne, France. Five merged shots ISO, 100, f/11, 24mm. I hope we are all well and had a great summer. For me, the dust is just settling from a hectic season. 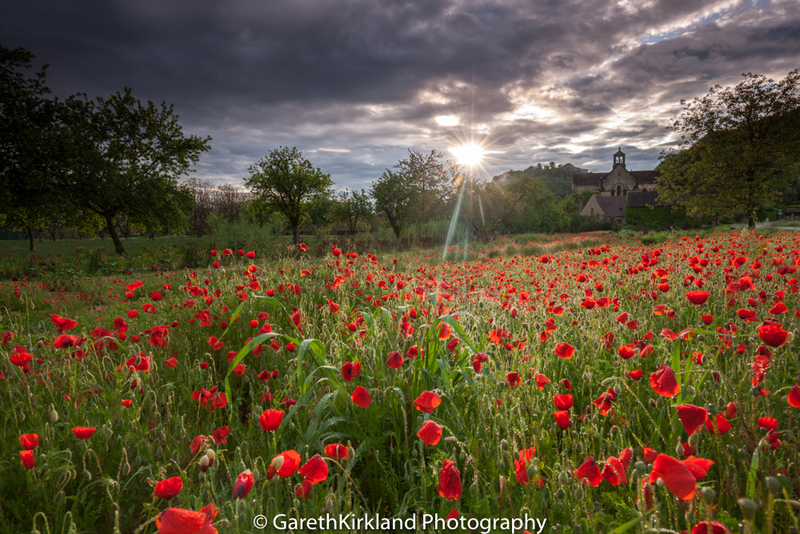 Again I’ve been concentrating on shooting round this area in the Dordogne and I’ve been very happy with the results. The panoramic above, relies on such specific lighting conditions, a full coverage of cloud cover across the sky, just enough cloud to hold back the sun but enough to illuminate the ground and all this had to stay long enough to take a five shot panoramic. Good technique and being able to work quickly in such situations is crucial. 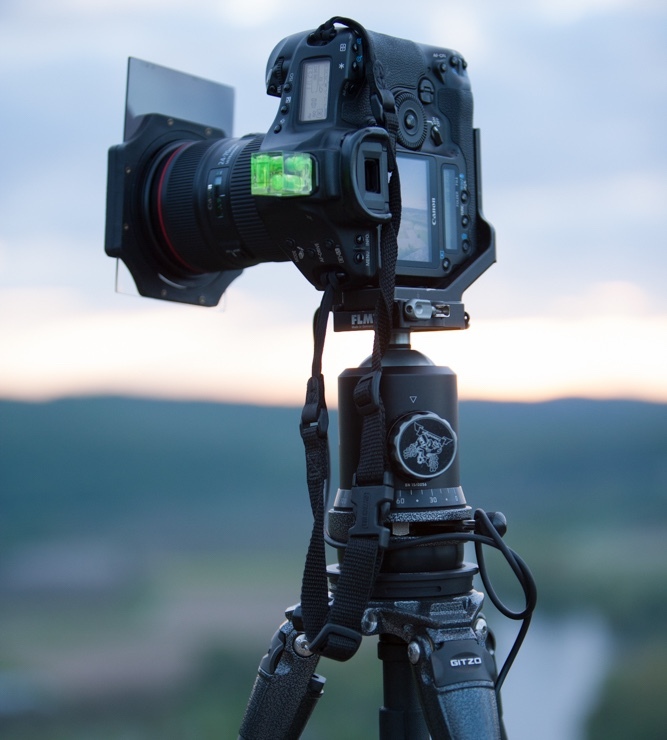 My fantastic Gitzo tripod along with a Gitzo levelling base and FLM Ball Head works like a dream, especially for panoramics. The Really Right Stuff L Braket also helps, stable and much easier to work with. I have also taken the plunge and invested in Canons latest flagship, high resolution camera, the 5DSR, with a whopping 50 million mega pixel sensor. I’d spent the last three or so years waiting for Canon to bring out the 1Ds Mrk 4, but it became clear they weren’t going to, so a decision had to be made. As much as I love my 1Ds Mrk 3, it was getting a bit long in the tooth. It’s taken a while to get used to the smaller body of the 5DSR, but apart from that, I love it. Superb detail, great colour rendition, and generally a joy to use. My only gripe however, is no inbuilt GPS?? For a camera clearly marketed at landscape photographers, it seems a strange omission. So I have also bought the Canon GP-E2 GPS receiver which fits onto the flash hot shoe and imbeds each photo with full GPS coordinates in the metadata. It’s rather large and does make the camera look like it’s grown an unpleasant lump on top, but it’s so useful to have all this information. To see my list of equipment please click here. Here’s all that gear in action shooting the panorama above. 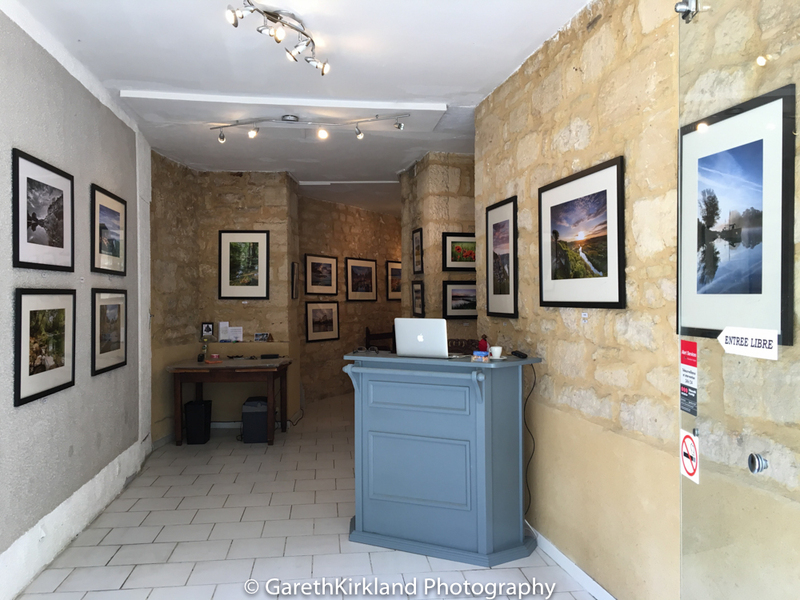 The big news however, is that I finally have opened my own Gallery in Sarlat. It’s taken a few years and a bit of gentle pushing from my patient partner Marie-line, but I finally took the plunge. It was a lot of hard work getting it all set up, especially as I started rather late in the season, but it’s all gone very well. 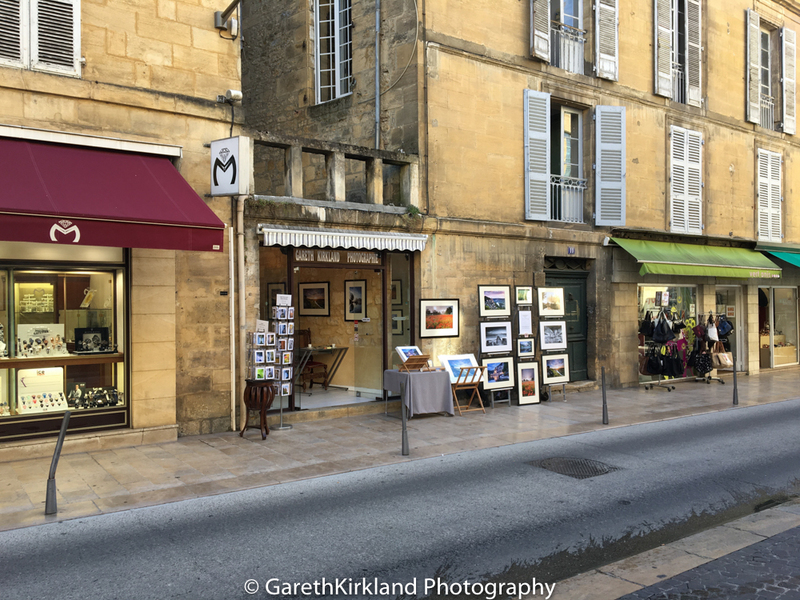 As you see, I have an outside space where I expose all my Dordogne images. 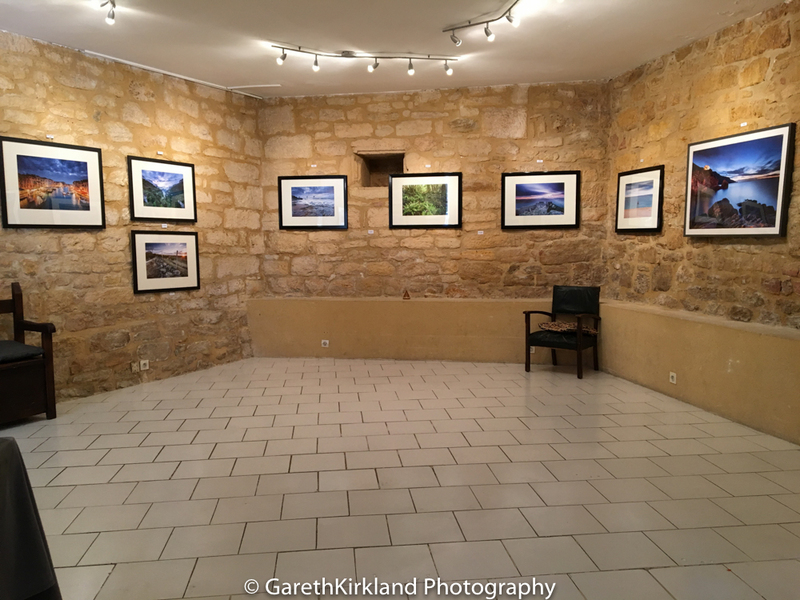 In the entrance I have another selection of Dordogne prints. Inside the gallery I have a large space where I now show my other work, images taken all over Europe. 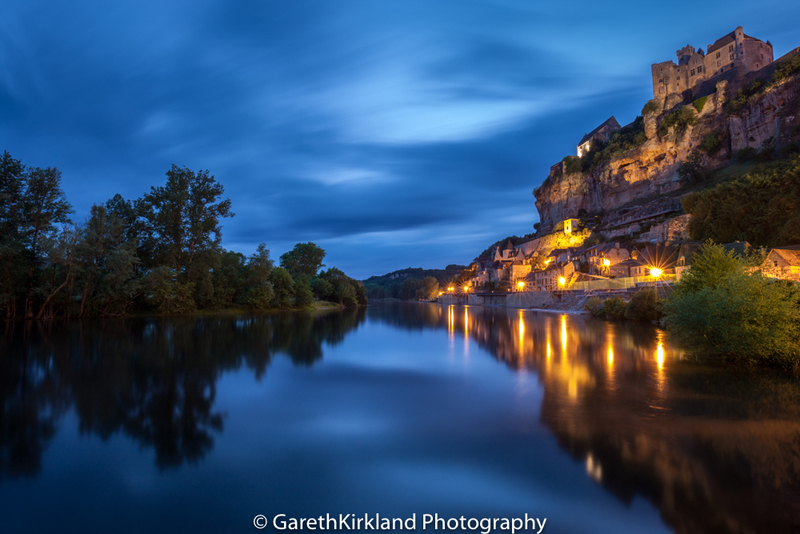 It’s been really satisfying to be able to show a selection of all my work, not just Dordogne pictures. It takes a huge amount of effort getting these pictures so it’s nice to see them in print and properly framed, and even nicer when they sell! Another development is that Marie-line will now be helping me, largely taking over the running of the gallery, as well as many other things. This will free me up a lot, firstly to take new pictures, and also devote more time to developing other areas of the business. I’m really looking forward to working with her and the fresh input that she will give. To see my latest work please click here. here. 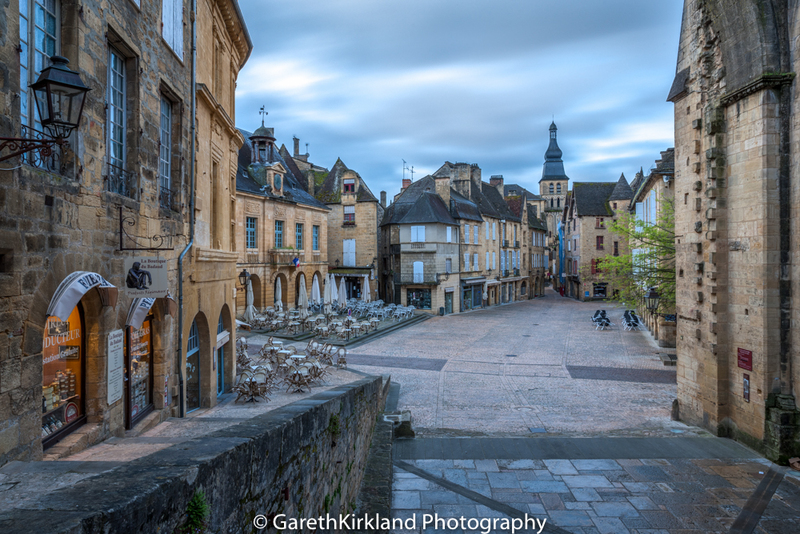 Sarlat twenty minutes before sunrise. Sarlat, Dordogne, France. ISO 100, f/11, 18mm. Three merged exposures. Chateau Beynac, one hour after sunset with nearly a four minute exposure. Beynac, Dordogne, France ISO 100, 16mm, f/8, 193 sec Lee Graduated Filter (hard) no 6. Both the first and last and last October Weekend Workshops are now full, but I still do have some space on the second weekend, the 14/17th October 2016. So if you fancy a last minute dash to the Dordogne, email me. One of the other benefits of Marie-line helping me, is that I will be much more freed up as to when I do my workshops. I have always been limited to which dates I can do, as I have been too busy during the summer months. I haven’t quite worked the dates out yet for 2017, but I will most likely be holding workshops in May, June, possibly July, September and October, with a maximum of six to eight workshops per year. Hopefully these dates will easier for people and a bit more inviting, for those wanting a bit of warm weather, as well as a great photographic weekend. My guests will also be staying in luxury accommodation in one of two local hotels, all with ensuite bathrooms and superb French food. This will inevitably mean the price of the workshops will have to increase, but hopefully my clients will consider this worthwhile, for the extra comfort. I’ll be posting the new dates on my website in the coming month or two. To check out availability and details for this October please click here. The church at Cenac at sunrise. Cenac, Dordogne, France. ISO 100, 22mm, f/11, 1/13th sec, Lee Graduated Filters (hard) no 9 & 3. Now composition is a big subject, and in the future I’ll maybe write in a bit more detail about certain aspects of composition. So these are my thoughts on composition in a general sense. Suffice to say, that any great image, will invariably have great lighting and great composition and hopefully good technique, though I would say that is less important than the first two. You might not be aware of that composition at work, but the effect of good composition, is that you are drawn into the image, it holds your attention and it makes you feel that that image could not be taken in any other way, it just feels right. Its like a great actor. The best actors appear effortless in what they do. The result of all their technical training and experience appears to be the most natural of things. When however, we see clumsy composition, as with poor acting, we are all to aware of the mechanics working behind the scene, which actually detracts from the experience, as though they are trying too hard. Of course there is lazy composition, where we haven’t noticed that in fact there appears to be lamp post sticking out of our models head. Thats why I always encourage people to think more before they shoot. Scan the frame from corner to corner, checking for distractions. If it doesn’t support the theme, get rid of it. So if there was one golden rule of composition, for me, it would be ‘Simplicity is Best’. Good images are often ruined by trying to get too much in the frame, rather than being selective and capturing the essence of the scene. So how do we achieve this simplicity? Often there is a lot going on in a shot, people, buildings cars etc. The answer lies, I think, in us being able to firstly, have a clear vision of the shot we want to take. What we want in, and what we want out. What lighting would we like, what time of day etc, etc.This clarity of thought and effort, will transfer to the final image. If we are confused and just snap away, hoping something miraculous will happen… well it probably wont. Even in a busy scene, there will be underlying shapes and objects that will form the body of the picture. Being able to see these shapes will help you clarify your composition. 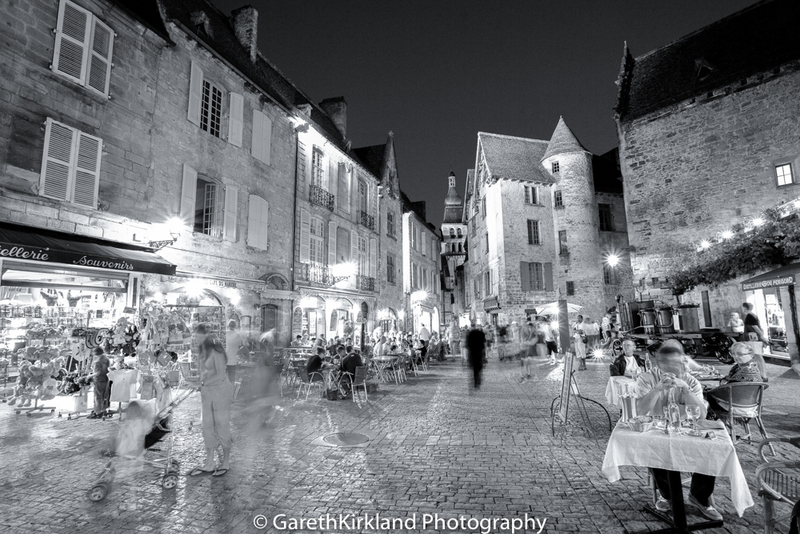 This, another picture of Sarlat, shows pretty much as hectic a scene as you can get and many compositions are a lot simpler than this. Essentially though, it’s a picture of four triangles, with people dressing the scene. Two diagonals are formed by the buildings left and right of frame. The third and fourth diagonals are made from the sky and the cobbled pavement. Diagonals always create a feeling of dynamic, which underlines the sense of hustle and bustle in this busy scene. I have paid, as always, careful attention to what is happening on the edge of frame. Notice the illuminated window in the right hand building. leave it in or out? It could be a distraction. I decided to leave it in cause I like it, you don’t have to overthink these things. Putting the man at the dinner table in the foreground adds depth to the image. I was extremely lucky with my man in black walking almost centre frame away from the camera, which gave an unplanned for focal point. Sometimes we need a bit of luck. If we are struggling to see shapes, half closing our eyes can help as it cuts out our peripheral vision, making the main shapes in a scene more apparent. I think some people are more natural at composition, but I do think with practice, that we can vastly improve. The goal always being, that we get to the point where we don’t have to think too much, but rather trust our instincts.